This simulation shows the motion of a uniform square under the influence of two forces and their associated torques. The force vectors can be adjusted by dragging the small blue points at the head and tail of each vector. Click the play button in the bottom left corner to watch the square move. Click the Stop button to set the square's velocity and rotation rate to zero (it will keep accelerating). Click the Center button if the square gets too close to the edge of the screen. 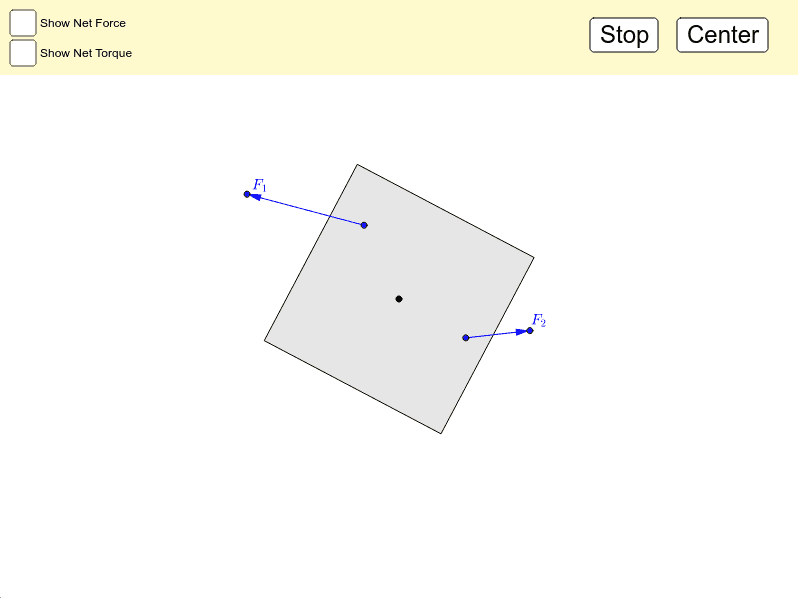 Find a few ways to place the force vectors so that the square rotates but doesn't translate. Find a few ways to make the square translate without rotating. Can you find a way to keep the square stationary without setting both force vectors to zero? Let the simulation play until the square starts moving and spinning. Can you adjust the force vectors to make the square temporarily stop without using the Stop button?